Heat-loving thermophile bacteria may have been some of the earliest lifeforms on Earth. 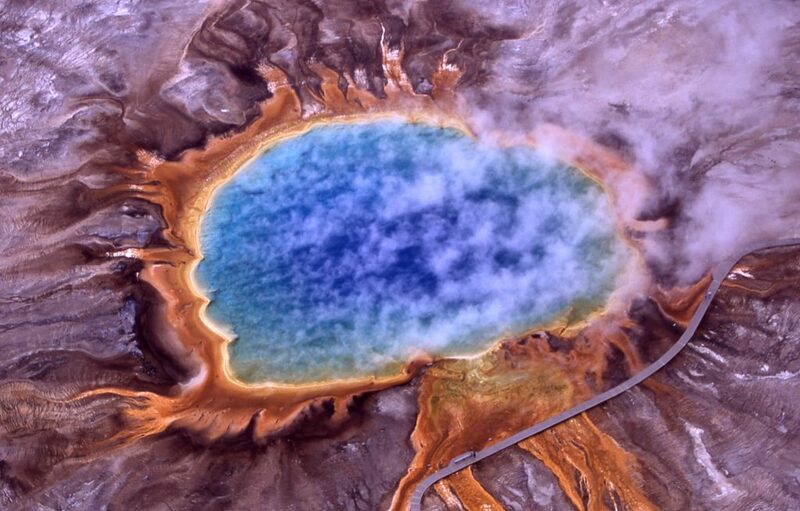 Researchers are studying their great great great grandchildren, like those living in Yellowstone’s Grand Prismatic Spring, to understand how these early bacteria repaired their DNA. Think your life is hard? Imagine being a tiny bacterium trying to get a foothold on a young and desolate Earth. The earliest lifeforms on our planet endured searing heat, ultraviolet radiation and an atmosphere devoid of oxygen. Benjamin Rousseau, a research technician in David Beratan’s lab at Duke, studies one of the molecular machines that helped these bacteria survive their harsh environment. This molecule, called photolyase, fixes DNA damaged by ultraviolet (UV) radiation — the same wavelengths of sunlight that give us sunburn and put us at greater risk of skin cancer. Though these proteins have been around for billions of years, scientists are still not quite sure exactly how they work. In a new study, Rousseau and coworkers, working with Professor David Beratan and Assistant Research Professor Agostino Migliore, used computer simulations to study photolyase in thermophiles, the great great great great grandchildren of Earth’s original bacterial pioneers. The study appeared in the Feb. 28 issue of the Journal of the American Chemical Society. DNA is built of chains of bases — A, C, G and T — whose order encodes our genetic information. UV light can trigger two adjacent bases to react and latch onto one other, rendering these genetic instructions unreadable. Photolyase uses a molecular antenna to capture light from the sun and convert it into an electron. It then hands the electron over to the DNA strand, sparking a reaction that splits the two bases apart and restores the genetic information. 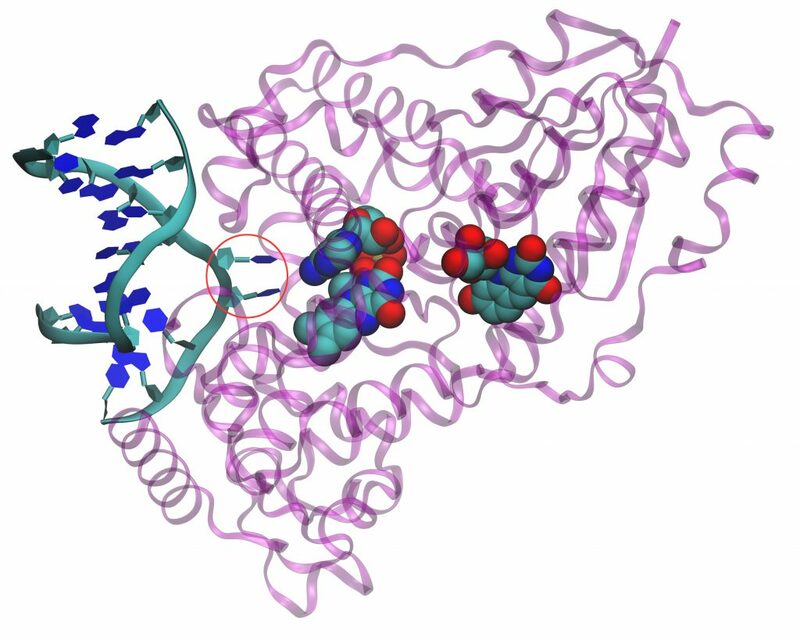 Photolyase proteins use a molecular antenna (green, blue and red structure on the right) to harvest light and convert it into an electron. The adenine-containing structure in the middle hands the electron to the DNA strand, splitting apart DNA bases. Credit: Benjamin Rousseau, courtesy of the Journal of the American Chemical Society. Rousseau studied the role of a molecule called adenine in shuttling the electron from the molecular antenna to the DNA strand. He looked at photolyase in both the heat-loving ancestors of ancient bacteria, called thermophiles, and more modern bacteria like E. Coli that thrive at moderate temperatures, called mesophiles. He found that in thermophiles, adenine played a role in transferring the electron to the DNA. But in E. coli, the adenine was in a different position, providing mainly structural support. The results “strongly suggest that mesophiles and thermophiles fundamentally differ in their use of adenine for this electron transfer repair mechanism,” Rousseau said. He also found that when he cooled E. Coli down to 20 degrees Celsius — about 68 degrees Fahrenheit — the adenine shifted back in place, resuming its transport function. “It’s like a temperature-controlled switch,” Rousseau said. Though humans no longer use photolyase for DNA repair, the protein persists in life as diverse as bacteria, fungi and plants — and is even being studied as an ingredient in sunscreens to help repair UV-damaged skin. Understanding exactly how photolyase works may also help researchers design proteins with a variety of new functions, Rousseau said.